Feel empowered after your 200 hour training! We have the proper tools for you to create classes on your own. Our module is intended to provide new and advanced teachers with strategies, inspiration and an intellectual approach to creating well rounded Yoga Classes for your students! Our 7 day course focuses on the art of sequencing and assists in a Holistic way. Each day we honor the 5 Elements and integrate them into our practice and teachings. The morning module will be a Sequencing workshop full of tools to inspire, create and enhance the yoga flow sequence for healing, connection and transformation. The afternoon module will be an Alignment & Assists workshop to explore the 5 movements of the spine and incorporate Thai Yoga Massage to provide support through our healing touch. We will take our practice to the next level with theme-weaving, bandhas, mudras, aromatherapy, mantra, meditation, and pranayama. This module will focus on Vinyasa/Hatha sequence structures looking at a peak pose and working backwards to examine the foundation to safely and effectively prepare for it. Together we will shift our perspectives as we study strategies to gain a deeper understanding of how each pose affects the one before it and the one after it. We will dive into sequencing theory and methods to develop and deliver a holistic experience for your students. Plan to step out of the norm and look at new poses, variations, modifications! Find imaginable ways to sequence a class that stirs your soul to create classes as you move forward! As teachers, it is important we are available to assist our students throughout the class to give them a holistic experience of alignment. That means we need to get off our mat, OBSERVE the room, and make adjustments along the way. We as teachers are the guide and our students come into the class looking for this support. We can offer this alignment in many ways; verbal, demonstration, spiritual and hands on. Our approach is through healing touch. There are many courses being taught that give little to no attention on hands on assists yet it’s always something Yoga Teachers are inspired to learn. This Thai Massage influenced hands on approach is designed to bring confidence to the teacher and to help the student deepen their experience in the pose by feeling a direct, firm and hands-on touch. Each day we will talk about the theory behind assists as well as move through each of the spinal directions and their associated poses moving from common poses to more advanced. We go through an in depth asana analysis on each posture in addition to learning hands on approach to the pose. Using a hands on approach is an effective way of understanding the alignment of body, mind and spirit. There is a lot of taboo around touch in a classroom, but done in a professional way, this can not be misunderstood. With a teachers pure intention to help guide their students into a deeper experience, there is no reason why we wouldn’t be able to use the modality of a professional and intentional hands on approach. Each day will consist of theory and practice leaving you with the confidence to move forward and share the teachings of yoga in a more well rounded, therapeutic and effective way. Randi is the founder of SuryaFlow: The Art of Sacred Movement, a philosophy that unites ancient practices with breath awareness to bring about joyful living. Randi has the power to make authentic connections with others and is inspired to bring union of mind, body, and heart to all who are ready to heal wholesomely and holistically. She continues to be a witness to her own transformation and is inspired to help facilitate this healing for others. She is playful and light hearted, yet grounded in discipline. Randi, E-RYT 500 is influenced by many traditions such as Ashtanga, Sivananda, Iyengar, Yin, and Restorative. She has facilitated over 25 International 200/500hr Yoga Teacher Trainings since 2010 and has helped to establish an experiential permaculture and yoga retreat center on Lake Atitlan, Guatemala. Kylie began practicing yoga over 15 years ago while living in Colorado. Teaching from her heart-center, she connects the origins of love and spontaneous flow to refined dedication to a structured practice. She is dedicated to cultivate yoga as a tool for students to empower their journey inwards and embrace the present moment. She studied in the yoga capital of the world, Rishikesh, India for 5 months training with an Iyengar certified teacher and began stepping into the role of a facilitator. Her instruction includes close attention to proper alignment with props and hands-on adjustments, and deepening the pose in order to reach ‘ah-ha’ moments. With breath based movement, her classes are taught to provoke mental and physical challenges to enable students to reach a blissful integrated awareness, acceptance and ability. Kylie is known to weave intentional Mantra music with her well-traveled ukulele. She hopes to inspire and share all the amazing gifts she has learned along her transformative yogic journey! Immerse yourself in an eco-friendly conscious community for a month of transformation. 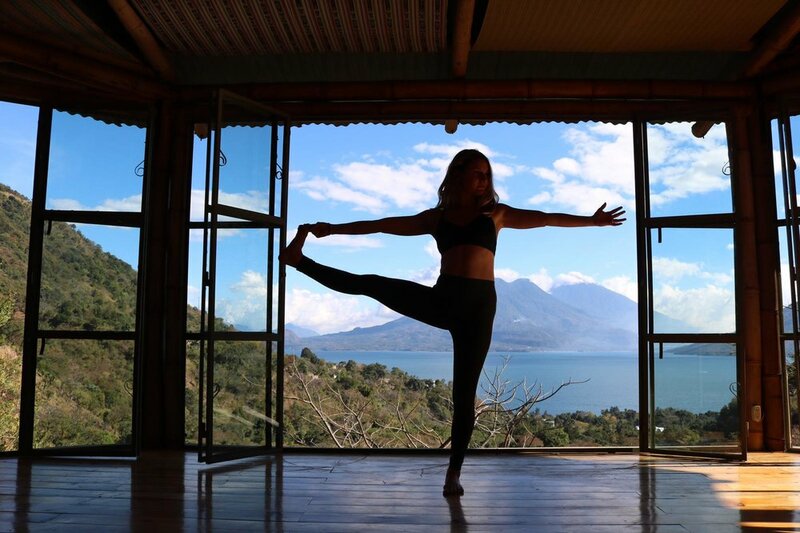 Enjoy the perfect sub-tropical climate in the western highlands of Guatemala, with stunning views through the Yoga Forest taking in Lake Atitlan and its magnificent volcanoes.